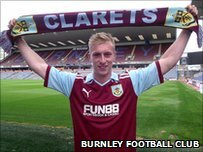 Burnley have taken Manchester City's England U21 defender Ben Mee on a season-long loan, manager Eddie Howe's first summer signing. The 21-year-old made his City debut in last season's Carling Cup and impressed during a loan spell at Leicester, making 15 Championship appearances. Mee is a product of the Blues Academy and captained the youth team to FA Youth Cup success over Chelsea in 2008. Clarets boss Howe has said he needs to lower the average age of his squad. He has also agreed to let experienced centre-back Clarke Carlisle, 31, join Lancashire neighbours Preston North End on loan for a year.